Analysis: It was the first time Goedert was held without a catch since Week 13 and his lowest snap count since the last time he faced New Orleans in Week 11. Despite the dud, the 2018 second-round pick finished the regular season with 33 catches on 44 targets for 334 yards and four touchdowns. 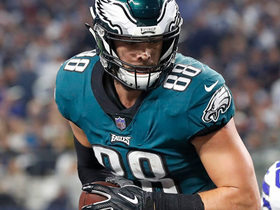 While he'll look to build on his promising rookie campaign, the 23-year-old's 2019 value will still largely depend on Zach Ertz's health. Analysis: The rookie has now caught multiple passes in three consecutive games for just the second time this season. 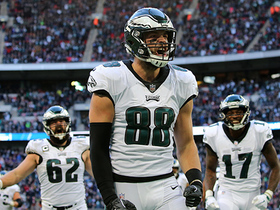 With the Eagles' postseason lives on the line Week 17 against the Redskins, Goedert gets a tough draw versus a pass defense that ranks in the top half of the league. Washington previously held Goedert without a reception in the Redskins' meeting with the Eagles back in Week 13. 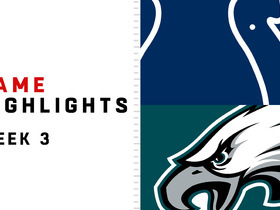 Analysis: Goedert caught Nick Foles' first passing attempt of the game for a 10-yard gain and converted a first down with his two-yard catch on the Eagles' final drive of the first half, but he was absent from the box score after that. The rookie played 39 snaps, marking his fourth straight week with at least 31. 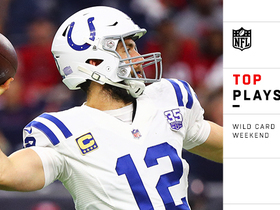 He remains a touchdown-dependent play for Week 16's home matchup against the Texans. Analysis: The good news is that Goedert drew at least three targets in his third consecutive game while seeing 39 snaps, his second-highest total of the season. But that makes three catchless games in his last four. The rookie is most useful as a Zach Ertz handcuff as the fantasy playoffs are set to begin or as a dynasty stash looking ahead to 2019. 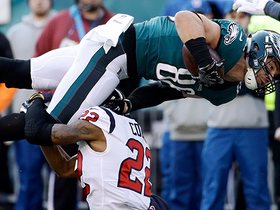 Analysis: They were Goedert's first catches and targets since before the Eagles' Week 9 bye. In more good news, the rookie played 36 snaps after not seeing more than half that in his previous two games. Still, his playing time and production of late have been unstable at best and nonexistent at worst. He'll try to get rolling at home Week 13 against Washington. Goedert failed to bring in his lone target during Sunday's 48-7 loss to the Saints. Analysis: Goedert has now gone two consecutive games without logging a catch, and three straight games with only one target. The second-round rookie remains the clear backup to starter Zach Ertz, but his decrease in playing time makes him difficult to trust for fantasy purposes. Goedert will look to bounce back during Sunday's tilt against the Giants. Goedert played just 18 offensive snaps and was not targeted in the passing game during Sunday's 27-20 loss to the Cowboys. Analysis: With five catches for 75 yards and two touchdowns over his past two games, Goedert seeing his fewest snaps since Week 2 comes as a surprise. For some reason, though, coach Doug Pederson used mostly one tight end in the first half, and the rookie's playing time dropped proportionately. Even if the Eagles return to their more typical two-tight-end formation going forward, the 23-year-old is tough to count on Week 11 at New Orleans, as he has more than two catches in just two games this season. 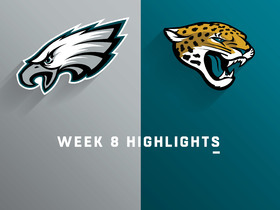 Goedert caught his lone target for a 32-yard touchdown in Sunday's 24-18 win over the Jaguars. 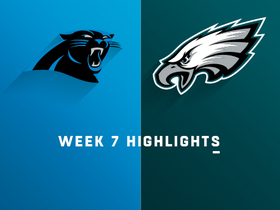 Goedert hauled in four of five targets for 45 yards and a touchdown in Sunday's 21-17 loss to Carolina. Analysis: Goedert got four of his looks on a single drive in the third quarter that ended with his touchdown catch. He wasn't very involved otherwise, but his reception, target and yardage totals were all still good for his second-best numbers of the season. The rookie has seen between 31 and 37 snaps in each of his last four games and is likely to see a similar workload Week 8 against Jacksonville at Wembley Stadium. Goedert caught his lone target for seven yards in Thursday's 34-13 win over the Giants. Analysis: The rookie has seen between 31 and 35 snaps in three straight weeks with no more than two targets. He was still on the field more than any Eagles pass catcher after Zach Ertz, Alshon Jeffery and Nelson Agholor, although Jordan Matthews saw 26, just six fewer than the South Dakota State product. The rookie just isn't likely to be a major part of the offense unless something happens to Ertz and remains more of a dynasty-league target for now. Goedert caught both of his targets for 16 yards in Sunday's 23-21 loss to the Vikings. Analysis: Both of Goedert's catches came on successive second-quarter drives, but he wasn't heard from again in the game. The rookie saw a slight uptick in snaps from Week 4, with 35 total or 59 percent, good for fourth-most among Eagles pass catchers. Still, it didn't result in many opportunities for the 23-year-old. He'll shoot for a better day against the Giants in Week 6. Goedert caught both of his targets for 13 yards in Sunday's 26-23 loss to the Titans. Goedert reeled in all seven of his targets for 73 yards and a touchdown during Sunday's 20-16 win over Indianapolis. 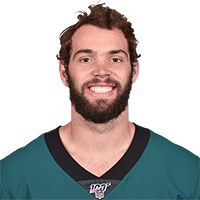 Eagles offensive coordinator Mike Groh said Wednesday he wants to increase Goedert's involvement, Dave Zangaro of NBC Sports Philadelphia reports. "We have a talented player in Dallas, and we need to find more ways to get him involved," Groh said Tuesday. "We need to get him involved more. We had some extenuating circumstances [Week 2 against the Buccaneers], for a variety of reasons." Goedert caught one of his three targets for four yards in Thursday's 18-12 win over the Falcons. Goedert is projected to see more playing time with Alshon Jeffery (shoulder) likely to miss two weeks, Jimmy Kempski of PhillyVoice.com reports. Analysis: The rookie has done nothing but impress this offseason and will get additional chances to show how "pro-ready" he is in the early going, thanks to the Eagles' banged-up receiving corps. Like most of the Philadelphia regulars, he was held out of the final preseason game Thursday in order to assure health for Week 1 at Atlanta. With Richard Rodgers (knee) also recovering from injury, the 23-year-old has an excellent chance at some targets in the seasons' opening weeks. Goedert caught two of five targets for 26 yards in Thursday's preseason loss to Cleveland. Analysis: That Goedert got the start alongside Zach Ertz and saw Nick Foles' first target of the day just goes to show how highly the Eagles prize their first-round rookie. The South Dakota State product has impressed in three preseason games thus far, racking up nine catches for 149 yards and a touchdown. The strong showing has him firmly ahead of Richard Rodgers (knee) on the tight end depth chart as the Eagles head into their final tuneup against the Jets. Goedert caught three of six targets for 57 yards in Thursday's preseason loss to the Patriots. Goedert (arm) returned to practice Monday, Eliot Shorr-Parks of NJ.com reports. Goedert is dealing with a minor elbow injury, Les Bowen of the Philadelphia Daily News reports. Goedert is being held out of Sunday's practice with a seemingly minor injury to his right arm, Reuben Frank of NBC Sports Philadelphia reports. Goedert exited to the locker room with trainers during Saturday's practice session, Eliot Shorr-Parks of NJ.com reports. Analysis: Goedert didn't make an immediate or eventual return to practice following the issue, which could have major implications depending on the reasoning behind his departure. The second-round pick is expected to fill the role as the second-string tight end behind Zach Ertz after the team released Brent Celek, as he performed well in his first preseason action with four catches for 66 yards and a touchdown. Goedert nabbed four of five targets for 66 yards and a touchdown during Thursday's 31-14 loss to Pittsburgh. 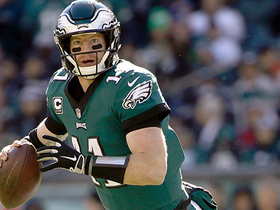 Analysis: The rookie settled into a soft spot in Pittsburgh's coverage on a scramble drill early in the second quarter, leading to a 15-yard Eagles touchdown. The second-round pick looks like a smooth receiver on a roster that knows how to get the ball to the tight end. If all goes as planned, he can slide nicely into Trey Burton's old role opposite starter Zach Ertz. 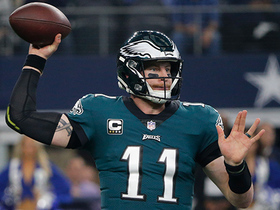 Philadelphia Eagles quarterback Carson Wentz's pinpoint pass to tight end Dallas Goedert beats Dallas Cowboys linebacker Jaylon Smith for 26 yards.